Here, we have four expected classes of phenotypes; so the degrees of freedom equal 4 — 1 = 3 and the associated probability is considerably less than .001. This very small probability indicates that the phenotypes are not in the proportions that we would expect if independent assortment were taking place. Our conclusion, then, is that these genes are not assorting independently and must be linked. In summary, testing for linkage between two genes requires a series of chi-square tests: a chi-square test for the segregation of alleles at each individual locus, followed by a test for independent assortment between alleles at the different loci. The chi-square tests for segregation at individual loci should always be carried out before testing for independent assortment, because the probabilities expected with independent assortment are based on the probabilities expected at the separate loci. Suppose that the genes in the cockroach example were assorting independently and that some of the cockroaches with curved wings died in embryonic development; the observed proportion with curved wings was then /3 instead of / In this case, the proportion of offspring with yellow body and curved wings expected under independent assortment should be V3 ^ / = / instead of %. Without the initial chi-square test for segregation at the curved-wing locus, we would have no way of knowing that what we expected with independent assortment was /6 instead of %. If we carried out only the final test for independent assortment and assumed an expected 1:1:1:1 ratio, we would obtain a high chi-square value. We might conclude, erroneously, that the genes were linked. If a significant chi-square (one that has a probability less than 0.05) is obtained in either of the first two tests for segregation, then the final chi-square for independent assortment should not be carried out, because the true expected values are unknown. Morgan and his students developed the idea that physical distances between genes on a chromosome are related to the rates of recombination. They hypothesized that crossover events occur more or less at random up and down the chromosome and that two genes that lie far apart are more likely to undergo a crossover than are two genes that lie close together. They proposed that recombination frequencies could provide a convenient way to determine the order of genes along a chromosome and would give estimates of the relative distances between the genes. Chromosome maps calculated by using recombination frequencies are called genetic maps. In contrast, chromosome maps based on physical distances along the chromosome (often expressed in terms of numbers of base pairs) are called physical maps. By doing a series of crosses between pairs of genes, we can construct genetic maps showing the linkage arrangements of a number of genes. Two points should be emphasized about constructing chromosome maps from recombination frequencies. First, recall that the recombination frequency between two genes cannot exceed 50% and that 50% is also the rate of recombination for genes located on different chromosomes. Consequently, one cannot distinguish between genes on different chromosomes and genes located far apart on the same chromosome. If genes exhibit 50% recombination, the most that can be said about them is that they belong to different groups of linked genes (different linkage groups), either on different chromosomes or far apart on the same chromosome. ^ ...and producing only nonrecombinant genotypes in the gametes, although parts of the chromosomes have recombined. I 7.11 A double crossover between two linked genes produces only nonrecombinant gametes. 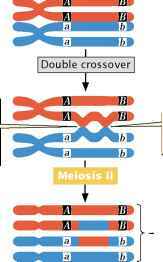 A second point is that a testcross for two genes that are relatively far apart on the same chromosome tends to underestimate the true recombination frequency, because the cross does not reveal double crossovers that might take place between the two genes ( FIGURE 7.11). A double crossover arises when two separate crossover events take place between the same two loci. Whereas a single crossover switches the alleles on the homologous chromosomes — producing combinations of alleles that were not present on the original parental chromosomes—a second crossover between the same two genes reverses the effects of the first, thus restoring the original parental combination of alleles (see Figure 7.11). Double crossovers produce only nonre-combinant gametes, and we cannot distinguish between the progeny produced by double crossovers and the progeny produced when there is no crossing over. However, as we shall see in the next section, it is possible to detect double crossovers if we examine a third gene that lies between the two crossovers. Because double crossovers between two genes go undetected, recombination frequencies will be underestimated whenever double crossovers take place. Double crossovers are more frequent between genes that are far apart; therefore genetic maps based on short distances are always more accurate than those based on longer distances. A genetic map provides the order of the genes on a chromosome and the approximate distances among the genes based on recombination frequencies. In genetic maps, 1% recombination equals 1 map unit, or 1 centimorgan. Double crossovers between two genes go undetected; so map distances between distant genes tend to underestimate genetic distances. The recombination frequency between a and d is 50%, indicating that these genes belong to different linkage groups, whereas genes b and d are linked, with a recombination frequency of 10%. To decide whether gene d is 10 map units to the left or right of gene b, we must consult the c-to-d distance. If gene d is 10 map units to the left of gene b, then the distance between d and c should be 20 m.u. + 10 m.u. = 30 m.u. This distance will be only approximate because any double crossovers between the two genes will be missed and the recombination frequency will be underestimated. 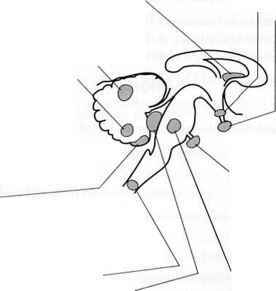 If, on the other hand, gene d lies to the right of gene b, then the distance between gene d and c will be much shorter, approximately 20 m.u. — 10 m.u. = 10 m.u.